As homeowners, the USPS charges us with the responsibility to maintain our mailboxes and posts in good working order. Also, as members of the Leacroft community, it is in our own best interest to maintain the appearance and uniformity of our mailboxes in the neighborhood as a component that contributes to the overall appearance of our community. This has a direct impact to the market value of our properties. Below, is information related to mailbox specifications that conform to HOA guidelines. In many cases, worn mailboxes just need sanded, painted and straightened. However, if your mailbox/mailpost needs to be replaced, please use the information below. Also, remember that failure to maintain your mailbox to USPS and HOA specifications may result in HOA fines and mail delivery delays by the USPS. The Eastwood mailpost features a 1-1/2″ square post with a ball finial and 6″ round newspaper holder. 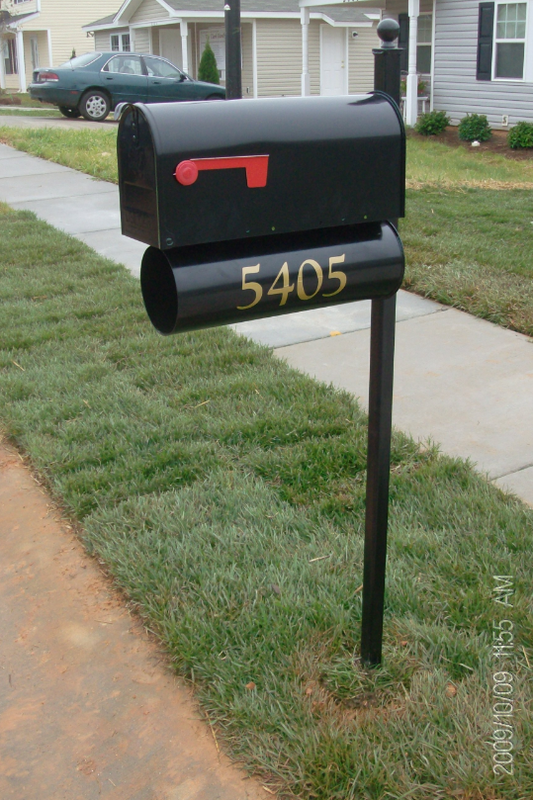 System includes a standard-sized (T1) rural mailbox and 3″ gold vinyl address numbers on the newspaper holder. The post is available in black finish only. Installation available. Every new mailbox design should be reviewed and receive the Postmaster General’s (PMG) seal of approval before it goes to market. Put your house number on the mailbox. If your mailbox is on a different street from your house, put your full street address on the box. A 2″-diameter (or similar) standard steel or aluminum pipe. Information current at time of memo. Additional information available at: www.usps.com.